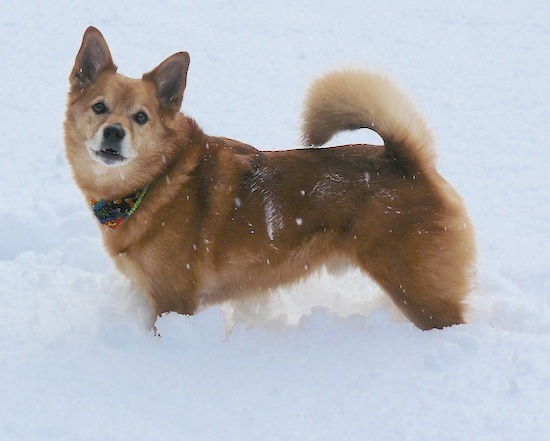 "This is Mooney, a Finnish Spitz out playing in the snow with us. He was about 10 years old in this photo that I took. The description and temperament found on dogbreedinfo.com is right on. We would always know when someone had pulled into the yard or was at the door or if the fox was on the porch; he loved to give us warning barks. He was great with our two little kids and very patient with them. When they got too energetic or loud, he would just head to somewhere quieter. He was smart too, he would problem solve how to get to a treat or toy when we hid them. He loved to run around outside and then come sit at the door and bark when he was ready to come back in. He was a great dog even toward the end when he became sick." The Finnish Spitz is friendly, active, playful, keen and courageous. It can be obedience trained, if the owner has an air of natural, gentle, calm, authority to them. The Finnish Spitz is renowned as a hunting dog, and also makes a great companion for family members of all ages, especially children and older adults. This breed does not fully mature until it is about 3 to 4 years old. The Finnish Spitz is aware of its place in the dominance hierarchy, and owners need to clearly communicate to the dog that its place is below all humans. Finnish Spitzes that believe they are higher in the order can become protective, demanding affection and attention, become domineering and can be fairly dog aggressive. Meek or passive owners will find them hard to manage. Socialize them well or they can be reserved and sometimes aloof with strangers. They are generally good with other pets. This breed is lively and curious, though not overwhelmingly so. They are loyal to their own families, but require much consistent patience and understanding. They are good watchdogs, but are not guard dogs. 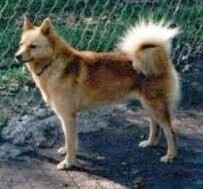 In Finland the Finnish Spitz is nicknamed the "barking bird dog." They were bred to bark a lot and even participate in barking contests, where it is not uncommon for a dog to bark over 150 times in one minute. 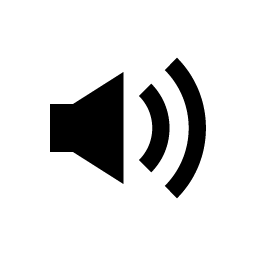 They were bred to bark (which can sound like a yodel) continuously to point the hunter in the direction of the game bird, therefore you will never get this dog to be totally silent. If you leave the dog outside for long periods of time without the proper exercise or human leadership it can become a nuisance. Teach this dog enough is enough and to limit its barking. Do not allow it to bark at you, as a dog that barks at its owner is displaying dominance behaviors. With the right owner they can make wonderful pets. The Finnish Spitz needs plenty of exercise, including daily, long walks or a jog, where the dog is made to heel beside or behind the human holding the lead, never in front, as instinct tells a dog the leader leads the way, and that leader needs to be the human. Simply running around a large backyard will not satisfy the canine's instinct to migrate. With enough proper exercise, it will be content to lie at your feet at night. This breed makes an excellent jogging companion.